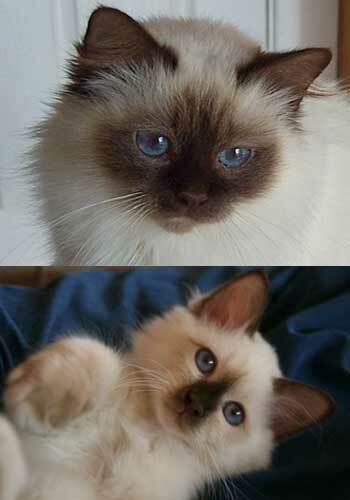 The coat pattern of the Birman resembles that of a Siamese, with the colour being on the face, ears, legs and tail (the points) with a contrasting lighter body colour. 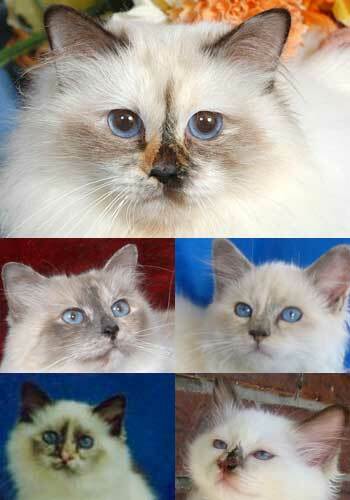 Birmans are born white and generally by the time they are ready to go to their new homes the colour on their points is a paler tone of what will be the mature colour. The coloured mask on the face may only be a smidgeon of colour showing down the nose and this can take 12 to 18 months to cover the entire face. The body coat colour ranges a cream in seal points, magnolia in lilac points, off white in cream points with a golden hue over the back desirable in all varieties. 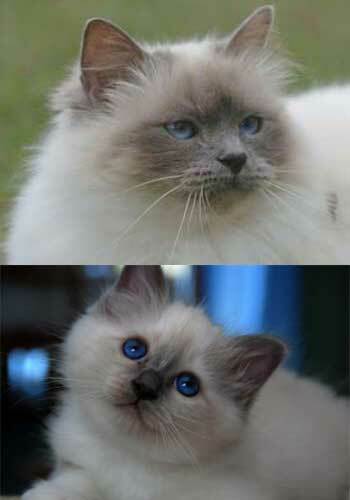 The eye colour ranges from a deep blue to a bright blue depending on the point colour. The features that make the quite special are its four white paws, referred to as "gloves" for the front feet and "gauntlets" for the back feet. They are pure white. This is one of the colours. The colour on the points is a deep seal brown which is warm and rich. The body colour is a shade of cream to beige with a soft golden . 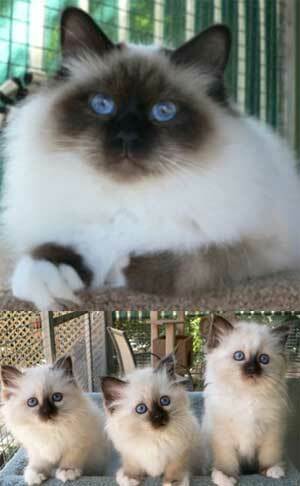 Another of the traditional colours like the seal point but a blue grey colour on the points. The body colour is a bluish white with a hue to tone with the points. The points are a warm, milk chocolate colour while the body is an ivory tone. 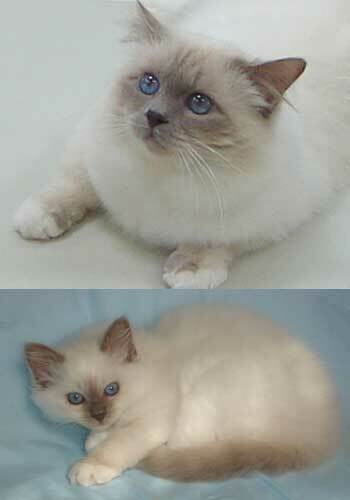 The hue of the body colour is very pale in comparison to the seal point and often keeps this lighter coat at maturity. The points are a delicate frosty grey with a pinkish tone. The body colour usually stays very clear and pale. The points are a brilliant reddish gold while the body coat is a pale cream. It is normal for red points to show some very slight tabby markings on the points. The points are a rich buff cream while the body colour is off white. 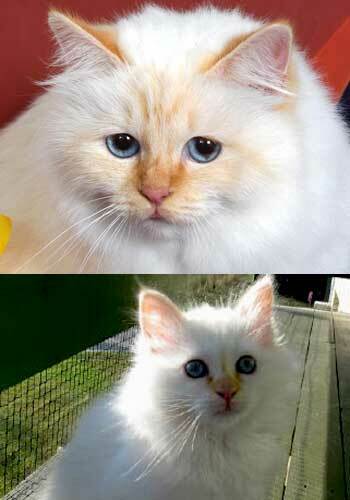 This point colour takes the longest to mature especially on the legs and at the time a kitten is ready to leave to go to their new home you may only just be able to see the white gloves and gauntlets. 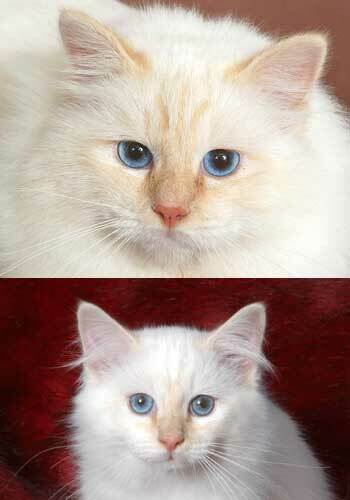 Cream points also often show some slight tabby markings on the points. Come in the first four colours listed above with the addition of the colours red or cream intermingled or patched throughout the point colour. The display of the colour is random and a very interesting colour to watch develop to full maturity. 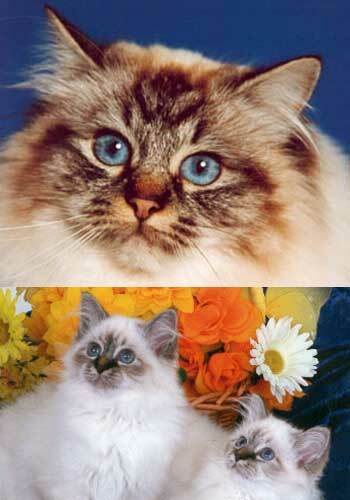 The point colour is equivalent to the tabby points but with a lighter silvery background to the tabby markings. This is a new colour available to Australia and presently we have only one member of our club breeding these special colours. The base of the point colour is a light silvery tone under the normal solid point colour. This lighter tone is also obvious on the underside of the tail and around the eyes. 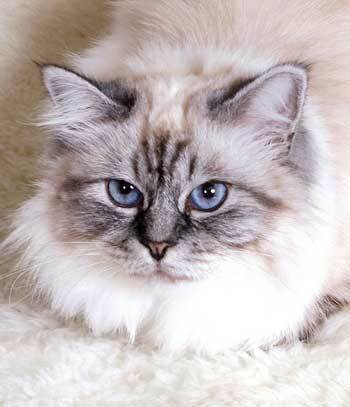 This effect is produced by the same gene that causes the silver tabby point and is also new to Australia.